Extremely versatile and lightweight GORE-TEX® Pro 40 Denier mountain shell with just the right amount of features, the Alpine Pro Jacket is for perfect for climbers and mountain walkers alike. Alpine Pro Jacket Gore-Tex - Mens is rated 5.0 out of 5 by 6. Rated 5 out of 5 by Josh Strauss from Pretty much Bulletproof I got this jacket right before my 5 day trip in Cathedral Lakes and I am very glad I did. We had all the weather from sunny and mild to 60km/h winds and snow. This jacket stood up to all the conditions. The pit zips kept me cool and comfortable when the sun came out and the thicker material of the jacket along with the gore-tex pro kept me dry during the downpours and heavy snow. The fit gave a little extra room for layering but without being super baggy, and the stiff rim on the hood was really helpful when it came to keeping the rain out of my face. Everything about this jacket is smart. Rated 5 out of 5 by AKIP from Excellent, as described. Jacket is very well made and feels/acts/looks like a high quality item. Fit was perfect for me and the value is good considering the specs versus other brands. Managed to get on a decent sale and VPO was very easy to deal. Would purchase again. 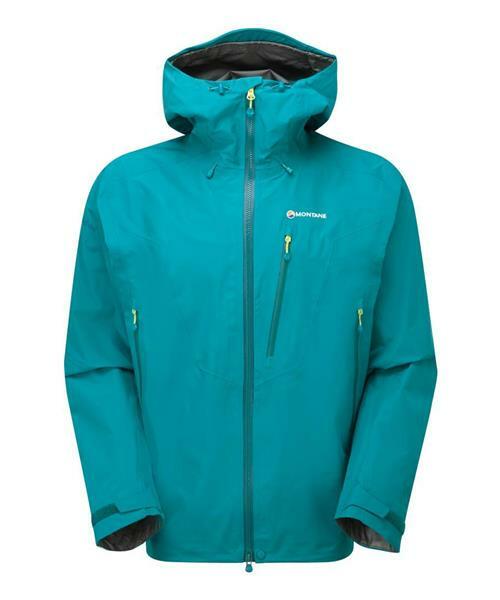 Rated 5 out of 5 by LocalHiker from Great Jacket for Winter Sports This jacket is great for in city and mountain use. Just got back from a difficult snowshoe trip, breaking trail in 3 feet of snow, steep slopes. No sweat build up at all, even with the pit zips closed. Hood worked well, kept out blowing snow. Rated 5 out of 5 by rjww from Montane jacket Took my jacket fishing on the Olympic Peninsula. You may be aware that sometimes it rains there. Had 1 1/2 days of some very wild rain and wind. The next day it had snowed overnight and was cold and windy, with sun. The jacket kept dry in the heavy rain, no leaks, yeah goretex, and warm in the wind (cold wind). Rated 5 out of 5 by AJackson from You can feel the quality! Bought online and the jacket arrived within a few days. Everything about the experience was superb. Love the fit and the feel! Rated 5 out of 5 by Justinsane from Use this jacked year round! I bought this jacket in April last year and I have had this jacket with me every trip I've done since. I'll break it down use by season / temp expiernce. Spring- great combined with a 200 weight ice breaker shirt didn't usually use much other layering other than that no complaints easy to open up venting and get extra air flow if your heating up. If it stops raining easy to roll up and throw in the bag. Summer- didn't pull it out much but had it folded up in my bag for break out storms more just for emergency but if it's raining I find I didn't heat to bad. Fall- did tons of late season hikes once again with a 200 weight merino wool. No problem pumping out 24km day trips with good vertical gain. Winter- I haven't used my insulated jacket since I bought this shell I'd way rather just layer appropriately and wear this. I've been out doing casual snowshoeing and some pretty steep stuff just with minor alterations in my base layer in temps as cold as -15 C so far 0 complaints. I even take it snowboarding. The coldest I've had it on the hill is -10 so far with a 200 merino and my arcteyx cartagin. Still have yet to whip out my 260 sweater hahaha. Features I love I still don't even think I've figured them all out on how you can wear it 1- fold it in the hood lock the straps for easy packing and storing when on the go. 2-fits a helmet when fully loosened hood on warmer winter days no need for a belaclava with the way you can position the hood and collar around your head. But also can snug fit the hood to your head with a couple string pulls and locks for less aggressive sports. Plus a hard brim to keep the water from draining in your face. 3- nice and easy to tighten up on the waist. 4- arm vents to help on hotter days 5- it still looks brand new and with proper Cleaning and treating It repels water like a water slide 6-I love how he pockets are set up I don't do any ice climbing yet in it but it has higher pockets so your harness doesn't block your pocket access. Some could see this as a negative point. It's not a comfortable jacket to put your hands in your pocket and wander around but the next step down if you want that ;). Bottem pockets are also designed for maps so they are massive go all the way up the jacket 7- very heavy fabric, I walk into branches sticks slide on things and I'm not afraid of this jacket tearing. The only negatives I see in this jacket is the inner pocket is a joke they should redesign it make it sealed and zipped for keys.